A recent Saturday afternoon robbery in Fashion Valley was caught by surveillance cameras, and police are seeking the public’s help in finding the two assailants. At 5:24 p.m. Aug. 11, police say, two men robbed a 27-year-old of his iPhone as he walked near the Forever 21 store. Police said one of the attackers approached the victim and asked to use his phone then grabbed the phone and ran away with an accomplice. The victim chased both assailants into a nearby parking lot, but one displayed a firearm in his waistband and told the victim that “he did not want any of this,” police said. Fearing he would be shot, the victim stopped chasing the robbers and they were last seen running towards Friars Road, police said. San Diego police officers responded to the area but were unable to find either assailant. However, they recovered an Airsoft pistol, thought to have been used by one of the men. One robber is described as Hispanic, about 16 years old, 5 feet 8 to 5-9 tall, with a thin build and wearing a navy colored short-sleeved shirt and black shorts. 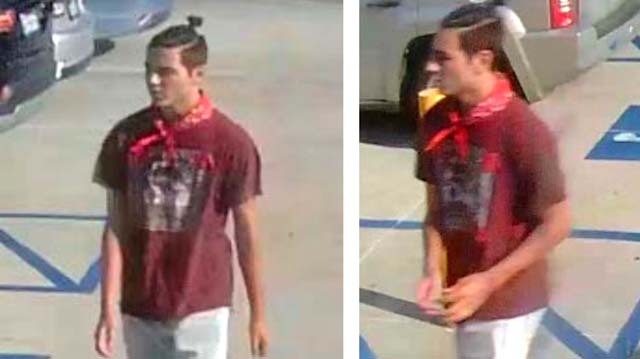 The other is described as a Hispanic, mid to late teens, 5-7 to 5-8 tall, thin build, hair placed in a bun, wearing a red short-sleeved T-shirt with tan pants. Anyone with information on this case should call the Police Department’s Western Division at (619) 692-4800 or the Crime Stoppers anonymous tip line at (888) 580-8477. Crime Stoppers is offering up to a $1,000 reward to anyone with information that leads to an arrest in this case. Visit the Crime Stoppers website at sdcrimestoppers.org for more information on how to send anonymous web and mobile app tips.